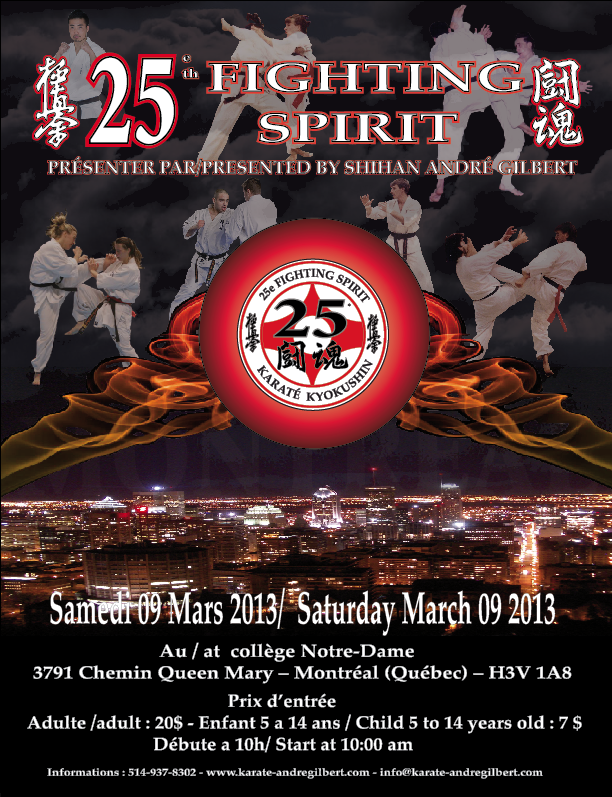 Banff Dojo along with head instructor/parent Daymon Miller were pleased to hear when 15 year old Tyler Pecsi, 3rd Kyu expressed interest in fighting at the 25th fighting spirit tournament presented by Shihan Andre Gilbert, in Montreal, Quebec. We didn't give it a second thought and registered right away. Assistant Instructor/1st Kyu/Mom (Julie Pecsi Miller) and sister (Kendra) made the trip as support /coaching team with Ty. Being the only fighter from Western Canada we felt a little nervous going in. Sensei Tats was officiating at the tournament and made the transition to a new place much easier. The venue exciting, the competitors new and different. Ty's fight was against a black belt by the name of Shariff Mohamed. Watching him warm up worried Ty a little based on the young man's flexibility. Shariff was one of the featured fighters from Honbu and it was an honour to fight him. The boys had a good fight, pretty evenly matched. Tyler fought hard and with vigour. He dominated the final part of the fight but not enough for the win. The experience for Ty was profound, the competition exhilarating. This may have been a loss on the mat for Ty, but is a driving force for him to prepare hard for such places as Los Angeles and perhaps New York again in the future. For now though we take the experience back to Banff and work hard over the next few weeks in preparation for the 30th Canadian Championships in Burnaby, where Ty plans on putting what he learned in Montreal to the test. Great experience all around. This entry was posted	on Monday, March 11th, 2013 at 7:44 am	and is filed under Uncategorized. You can follow any responses to this entry through the RSS 2.0 feed. Both comments and pings are currently closed.